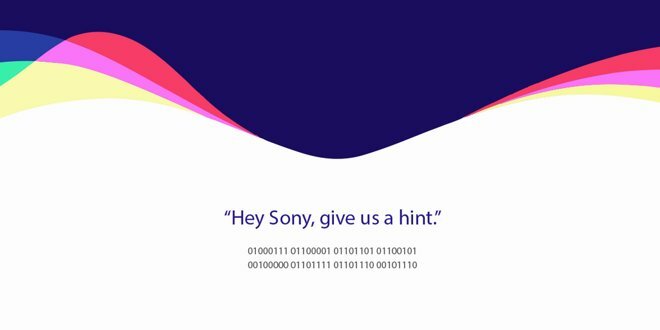 Looking for some publicity of its own, Sony on Wednesday morning posted an image on its Xperia Twitter account making fun of Apple's press event, which is expected to feature not only new iPhones, but also a revamped Apple TV with support for third-party game downloads. "Hey Sony, give us a hint," the image read, with Apple's Siri-themed event graphic in the background. Below that text was binary code, translating into the words "Game on." Sony recently announced three Xperia Z5 smartphones, the main model featuring a 5.2-inch display, 3 gigabytes of RAM, a fingerprint sensor, and a 23-megapixel rear camera. The 5.5-inch Z5 Premium, though, is being touted as the first smartphone with a 4K display. The centerpiece of Apple's event is expected to be two new phones, the iPhone 6s and the 6s Plus. These could potentially support 4K video recording, thanks to rumored 12-megapixel Sony camera sensors, but there has been no suggestion of the devices sporting displays sharper than the iPhone 6 or 6 Plus, the latter of which tops out at 1080p. Apple may also present new competition for Sony in the form of an updated Apple TV with features like Siri support, an App Store, and a touchpad remote. Gaming has been rumored as a major feature of the device, which —if successful —could put a dent in sales of Sony's PlayStation 4. Coincidentally, Apple's presentation coincides with the 20th anniversary of the launch of the original PlayStation in North America. Sony and its fans have been commemorating the occasion with the hashtag #20YearsOfPlay. The Apple event is due to start at 10 a.m. Pacific time, or 1 p.m. Eastern. AppleInsider will be providing live coverage from inside San Francisco's Bill Graham Civic Auditorium. Download the AppleInsider app to get all of the news as it breaks.